With a different and catchy name, Ainsworth’s another popular game is Hotter than Hot. It is a five reel game with three rows making a total of 15 cells within them holding the attractive symbols. The game has 30 paylines. The user interface is really simple and easily understandable. All the guidelines and rules of the game are present within it for the ease of the players. Not just the name, but even the features of the game are completely different and interesting at the same time. The theme being followed in it is Egyptian and every bit of the game’s appearance will remind you of that for sure. Excellent graphics and sound effects can be experienced during the game. It also gives out multiple bonuses which can be triggered with a few symbols about which you’ll know more ahead in the review. The game has multiple symbols in Egyptian look ranging in value. 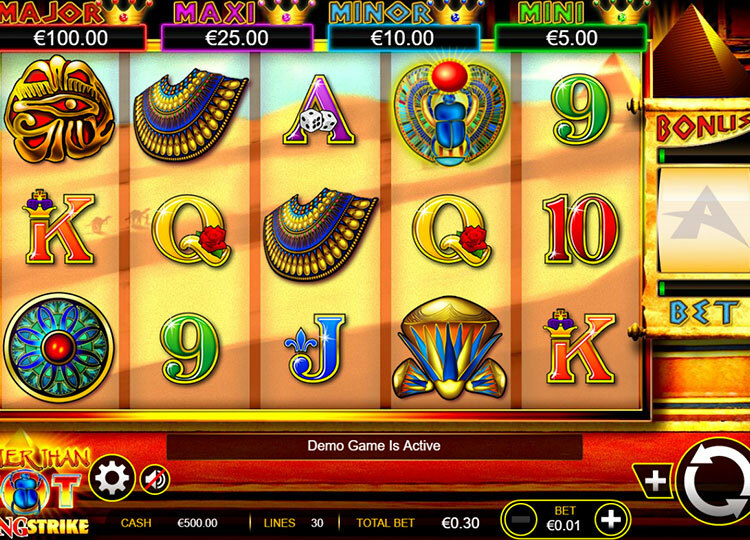 Similar to many of the slot games, the symbols are high paying and low paying both. Following the game theme, they’ll give you an entertaining feel of being in Egypt while playing with the attractive and colorful symbols. The high paying symbols are some Egyptian articles whereas low paying symbols are the regular card game symbols. The symbols of high value include a flower, a native Egyptian necklace, a treasure in the pendant or medal style, an icon representing the eye of the Horus and an Egyptian bird. The bird is the highest paying symbol of the game. These being the high-paying symbols are also known as the standard symbols. The low-value symbols, on the other hand, include the card values starting from numerical 9 to Ace. Which means 9, 10, J, Q, K, and A. All of these symbols also have some or the other decorative effect added to enhance their appearance. Apart from the basic symbols, there are pyramids with wild written on them which are the wild symbols. The scatter symbol is represented by a beetle. The last symbol is the crown which is only spotted on the sixth reel in order to initiate the bonus round. In order to trigger this feature, you have to get three or more of the beetle symbols or in other words, the scatter symbols anywhere on your gaming reels. This will not just multiply your bet, but would also give you 10 free spins for the game. While the free spins will be in action, the 5th reel will entirely be covered with the wilds. And in case a wild lands up in this time on 2nd or 4th reel, it’ll stretch up and cover the entire reel giving you stacks of winnings. If another three scatter symbols (beetles) show up in the reels, a total of 5 more free spins will be given to you to enjoy. If you have already seen the gaming screen or its image, you might have noticed the 4 heads as mini, minor, maxi, and major along with some values written beneath them. Well, they are the jackpots which get triggered with the appearance and non-appearance of the wilds and the crown on the sixth reel. You can only win a single jackpot at one time. For all the four jackpots, attaining a group of five symbols is necessary. It can be a group of 5 high paying symbols or a group of low paying symbols. The presence of crown is also mandatory on the sixth reel. A variant factor that’d determine the type of bonus that you’ve won is the presence or absence of the wild symbol on the reels. The chances of triggering the jackpot increases when you are playing the free spin bonus as the fifth reel already turns into a wild completely. Although the game doesn’t offer anything extremely new, it can’t be denied that the graphics of the game couldn’t have been any better. The Egyptian feel of the game is being spectacularly followed and has added immense value to the game. It is a decent play and an entertaining slot you can try your luck on.